Material of significance for the history of publishing and printing is part of the Rare Books and Printed Ephemera collections at the Bodleian Library. The earliest-known book dust wrapper was discovered in the Bodleian collections by the Bodleian’s former Head of Special Collections, Michael Turner, during the 1970s. 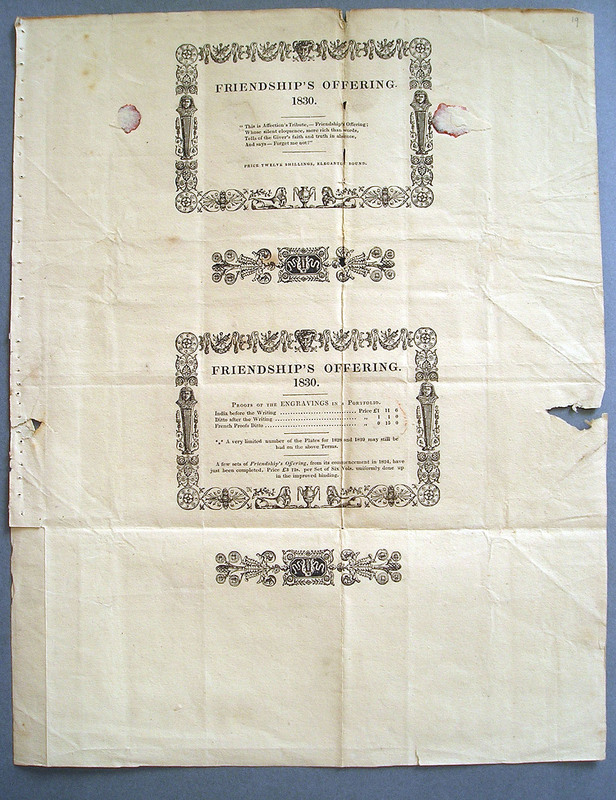 Dating from 1829, it protected a finely-bound gift book entitled Friendship’s Offering. The wrapper had been separated from its book, and has now been catalogued individually. Scholars are now recognizing this as the earliest known dust jacket. The cover came to the library in 1877 when the Library bought a collection of book-trade and other ephemera at the auction of Gillyatt Sumner, a Yorkshire antiquary. Now the dust wrapper is part of a collection of pamphlets based on those bequeathed by Charles Godwyn in 1770 but added to by the Library until the end of the 19th century. The shelfmark is G.Pamph. 2921 (19), found in the volumes G.Pamph. 2920-21 (Outsize). This dust wrapper once enveloped the book completely and was secured with sealing wax, traces of which can still be seen on the Bodleian’s original. Creases at the edges where the paper had been folded indicate the shape of the book it had enclosed. Several distinctive elements were printed on the dust jacket: the book’s price of 12 shillings; a promotional slogan stating that the volume was ‘elegantly bound’; an advertisement for the first six years of the Friendship series ‘uniformly done up in the improved binding’; and another advertisement for proofs of the engravings in portfolios. Other resources for the study of publishing history in the collections include the “Booktrade and Publishing” portions of the John Johnson Collection of Printed Ephemera. 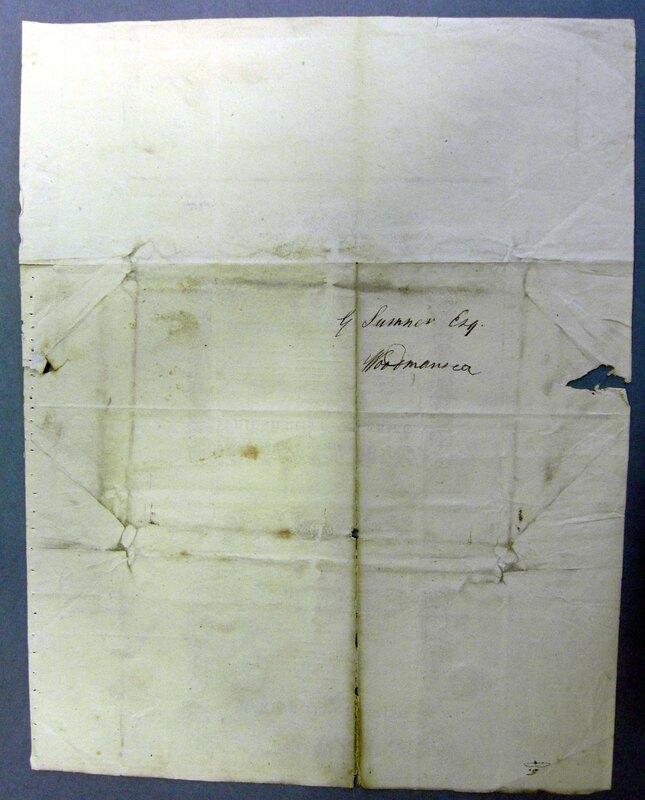 The verso of the wrapper shows an address to G. Sumner, Woodmansea [or Woodmansey, East Riding of Yorkshire]. Might be worth mentioning that “earliest known” here presumably refers to Western books — the oldest book wrapper in the Japanese tradition is dated to the Kanbun 寛文 era (1661-72) for a set of maps and to the Kyôho 享保 era (1716-35) for playscripts and other books. They’re pretty common by the 19th century. They’re called shotai (or fumibukuro 書袋) “book bags” — but they’re really wrappers, open at top and bottom, a kind of forebear to modern Japanese books’ obi 帯, perhaps.